Towards the end of 2017, a number of leading international tile, ceramic and stone exhibitions were held, with some of the most innovative products, trendiest designs and inspiring thinking presented specifically at Cersaie and Marmomacc. We’re excited to share some of the latest products and trends that grabbed our attention at these highly respected and well attended events. Extra-large tile formats have gone from being a niche, highly marketed product to something that is specified so often that manufacturers simply cannot afford not to support the trend. Since 2006, large format tiles have been popping up in the design community, but mainly as an architectural product. All of the major tile manufacturers had new or adapted extra-large format tiles on display at the recent trade shows and exhibitions. Terrazzo-look tiles are set to take the tile sector by storm in 2018. These tiles are more exciting, with fresh designs showcasing interesting geometric patterns and shades. With Terrazzo-look tiles, small marble rocks are ground flat and put in the clay for a more comfortable walking surface. These floors are often poured using combinations of marble chips and coloured concrete before they are polished. The classic tile style that was used in palaces and buildings in the 17th century is making a fierce comeback. Manufacturers such as Adex (Earth series) are presented in monochromatic hues of green, rose and blue, with decorative lines that imitate natural motifs. 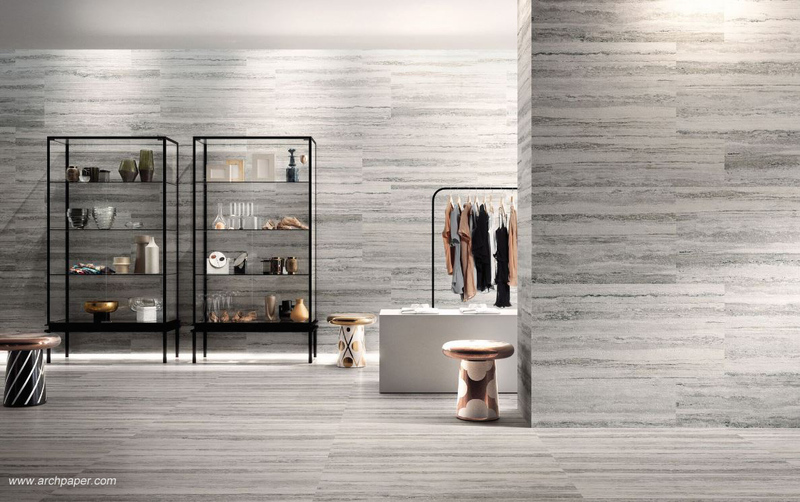 Dramatic marble-effect porcelain slabs were found at the biggest trade fairs. These porcelain slabs are more realistic than ever before, showcasing natural-looking veins as well as bold lines and splashes of colour. A number of Carrara marble inspired tiles were seen at the show. Unique tiles are the result of handmade processes that showcase everything from destressed looks and grated surfaces to chipped enamel. This individualised process of reproducing hand-made traditional Cementine tiles also ensures that no two tiles look exactly alike and is being used to beautify both walls and floors all over the world. The Doney collection by Vives is an example of handmade tiles where mismatched shapes blend together perfectly. Tiles with patterns of all sorts, and clever, eye-catching geometric lines were a big theme. Patchwork tiles were very popular, with this design being featured at many of the stands. The tiles from Sant’Agostino showed how temporary tiles could be used as a focal point for a room. The quirky Emil stand also revealed what can be achieved with reflective floor and ceiling tiles. Sant’Agostino’s stand stood out when it came to mixing everything from tone and texture to depth and materials. Everything from fabric finishes and eclectic material pairing is big at the moment. Contrasting looks, for example a marble like a Carrara that is paired with a wood look or cement, creates unique and striking effects. Style and simplicity are increasingly being fused together, especially in minimalistic spaces. The Provenzal Series by Ceramicas Vilar Albaro creates harmonious asymmetry by mixing and matching small, decorative pieces with muted pieces. The 52nd edition of Marmomac, which took place in September 2017, attracted 68 000 operators from 147 countries. Over 60% of the companies at Marmomac were international companies from 56 countries. “This edition also achieved the objective of expanding business for natural stone companies that concluded important contracts and signed orders for materials and technologies alike,” said Maurizio Danese, President of Veronafiere. Attendance at Cersaie 2017 exceeded 110 000, with an increase in both international visitors (53 182) and Italians (58 422). 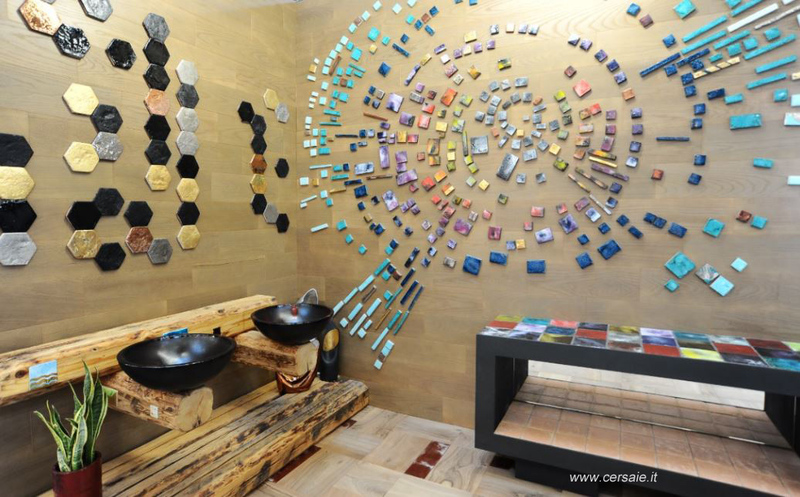 With a total exhibition space of 156 000 square metres, Cersaie saw growth in all exhibiting sectors and hosted a total of 869 exhibitors (17 more than in 2016), including 323 foreign companies from 41 different countries, almost a third of the total. The best represented sector was that of ceramic tiles with 457 companies, followed by bathroom furnishings with 197 exhibitors, confirming the key importance of these segments at the show. Specialised tip: Mosaic pieces are becoming more modern and sophisticated, with bright colours that remind you of the metallic hues that were popular in the 1990s. Thanks and acknowledgement are given to www.ceramic.co.za www.tiles.ie, www.markets.businessinsider.com, www.marmomacc.com and www.confindustriaceramica.smart.it for some of the information contained in this article.